Don’t you just love the colors fresh colors of Spring and Easter? I so admire all the beautifully colored Easter eggs that all my friends put on their buffet tables at their Easter gatherings. I love to look at them but I always thought they were very difficult to make, but alas, I was wrong. While searching the web I came across many variations of colored / dyed eggs. Make this Easter fun and colorful with the following ideas. 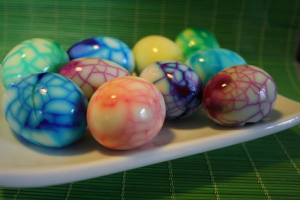 Here is an easy recipe for deliciously Marbled Easter eggs from www.barefootkitchenwitch.com. 2. Completely cool the eggs. 3. Gently roll the eggs on a hard surface to crack the shell. 4. Dissolve food coloring (gel preferred) in the water in a large coffee mug or deep bowl. Using a different mug for each color and enough water to cover an egg, but not enough water that it will spill over when you put the egg in the mug. 5. Submerge the cracked egg into the mug. 6. Put in refrigerator. The longer they soak the deeper the color. 7. Remove from mug and gently roll in paper towel or cloth towel to break shell so it can be removed. 8. You now will have beautiful marbled eggs to display on the table and then be eaten. 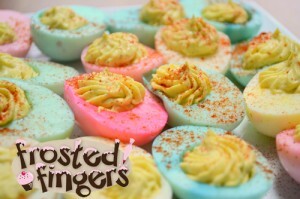 I am borrowing the follow recipe for Dyed Deviled Eggs from www.FrostedFingers.com. 1. Cut your boiled eggs in half, lengthwise and remove yolks, save for future use. (you use the yolks for the deviled filling). 2. Place about a half cup of water in a glass and then drop about 5 drops of food dye into the water. 3. Drop your egg halves into the water and let sit for about 30 seconds, or as long as you’d like for darker colors. If you’d like a swirly look, drop more food coloring in the water while the egg is in there. 4. Take your eggs out of the dyed water and let dry cut side down on a paper towel. 5. Once dry, fill your now pretty colored egg shells with your favorite filling. You can use cake decorating piping bags and frosting tips if you wish. Let me know how these turned out for you. I am anxious to hear about your entertaining, dining tidbits! Email your bloopers and your successes to party@partyandentertain.com! I will withhold your name if you wish.